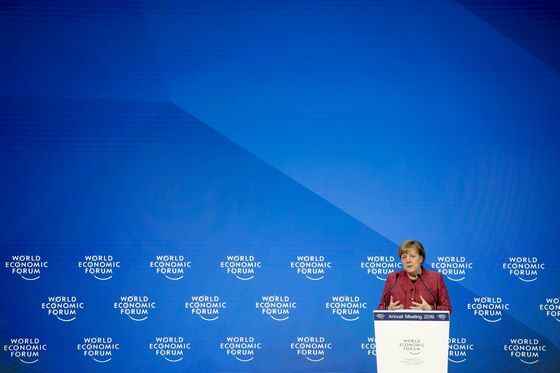 (Bloomberg) -- Angela Merkel told an audience of global business leaders how she yearned for a resumption of conventional monetary policy. It used to be bad form for government heads to be seen trying to tell central banks how to do their job. But that’s changing with leaders now much more comfortable weighing in -- some more aggressively than others. 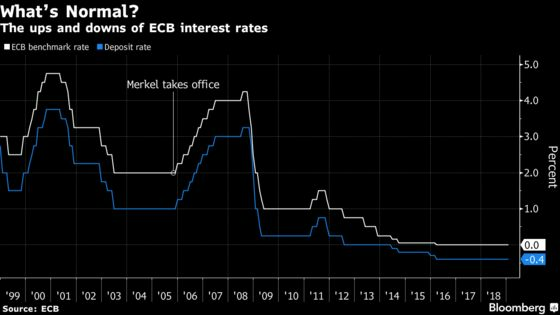 In the past Merkel has refrained from wading into monetary policy by defending the independence of the European Central Bank. President Donald Trump has been more pointed, arguing the Federal Reserve has been too aggressive in raising rates. In the U.K., the Bank of England has come under attack from pro-Brexit supporters over its grim economic forecasts about the costs of leaving the European Union. The ECB is years behind the U.S. Federal Reserve in tightening policy. The Frankfurt-based institution only ended its bond-buying program last month and says it’ll keep interest rates at record lows -- the deposit rate is minus 0.4 percent -- until at least after the summer. Investors don’t expect a hike until next year, and some economists say the central bank may have missed its chance to increase borrowing costs at all. The ECB’s fear is that if it moves too soon, it could worsen the region’s already-slowing economy. That concern is fueled by missteps in 2011 when rates were hiked twice just before the euro zone tipped into a recession. Merkel also made a bid for the 19-member euro area to ratchet up its global presence to counterbalance the outsize strength of the dollar. The chancellor cited U.S. sanctions on Iran and the direct impact it has on business decisions to pull out.